There is nothing more frustrating than watching your once fresh and vibrant fruits and veggies dry up or rot before you get the chance to enjoy them. Sadly, the amount of food wasted by the average consumer every day is incredible. In fact, according to the Food and Agriculture Association of the United Nations (FAO), a group whose mandate is to reduce food loss and waste, every year, roughly 33 percent (1.3 billion tonnes) of all of the food produced for human consumption is simply lost or wasted (1). They further state that between 40 and 50 percent of all fruits and vegetables are never actually eaten. That’s almost half! It’s truly astounding, especially when you think that if just one-fourth of this food were saved, it would be enough to feed 870 million hungry people in the world! It kind of puts things into perspective. Part of the problem is that we simply don’t know the proper way to store our food. We have the best of intentions, but by the time we actually get around to using our fresh fruit and veggies, they are already spoiled. Well, no more. Here are 15 food storage ideas that will help put a dent in those mind-boggling food waste statistics for good. While your celery comes in a plastic bag, it is actually a death trap for fresh celery because it traps the ethylene it produces inside, which accelerates the rotting process (2). Aluminum foil is the perfect solution. Just wrap the entire celery stalk in the foil and store it in your refrigerator as you normally do. 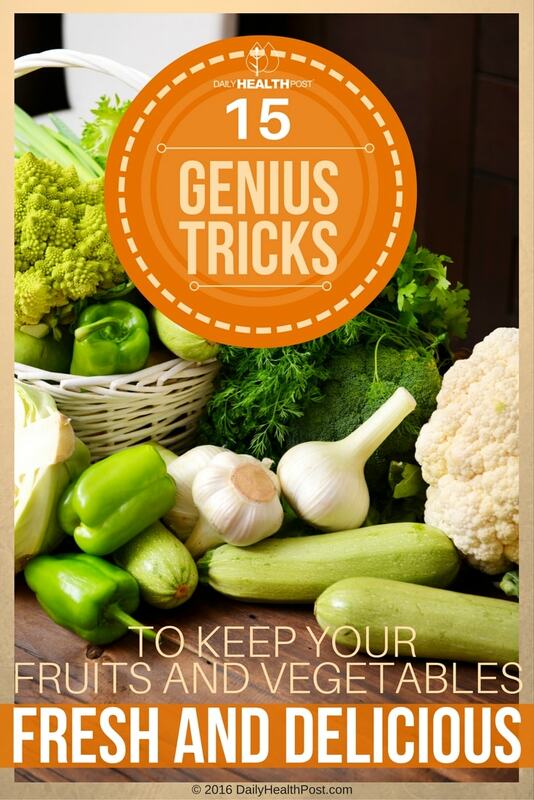 The tin foil allows the gases to escape, which keep your celery fresher and crisp longer. Your grandmother probably stored potatoes in her root cellar, but most homes today don’t have one, which means you have to improvise. Start by making sure you store potatoes in a dark, cool spot around 50° F. If you don’t have a cold storage area, just make sure you don’t store them next to the oven or under the sink where it tends to be warmer. As well, never store potatoes on your countertop or anywhere out in the open and exposed to sunlight since this will make them sprout faster. Instead, put them in a drawer or a basket. You can also put them in a closet or use a paper bag or even a bamboo vegetable steamer. While you may think that storing them in your refrigerator is a good option, according to studies, this can actually make your potatoes deadly! Apparently, storing potatoes in the fridge triggers a process that increases the amount of sugar they contain, which further leads to higher levels of acrylamide, a chemical in potatoes released when baked, fried or roasted at high temperatures. Among other things, studies show that acrylamide causes cancer (3). Another potato no-no is storing them with your onions. According to researchers at Penn State University, you should always separate these two veggies because close contact will not only make your potatoes taste more like onions, but both emit moisture and gases that will accelerate the sprouting process (4). Bananas seem to go bad so quickly, especially in the warmer weather. When you buy bananas, if they come in a plastic bag, remove it as soon as your get home as it will trap much moisture and cause the fruit to rot. Place bananas away from direct sunlight or heat and never put them in the fridge as this interferes with the natural ripening process, although once ripened, you can store them in your refrigerator’s vegetable drawer to halt the process. Even though the peel will continue to turn brown, rest assured the fruit will stay fresh and firm for 1 to 2 weeks according to Dole Bananas (5). You can also slow the ripening process and can keep your bananas fresh and yellow longer by separating each banana from the bunch. To prevent over ripening, simply wrap the stems of the bananas in plastic wrap. This prevents the ethylene gas produced naturally during the ripening process from spreading to other parts of the fruit (6). Every time a bacterial outbreak that is linked to food hits the headlines, people rush to “super wash” all of their fruit and veggies the minute they get them home. But according to experts, washing fruits and vegetables before storing them can actually make them spoil faster (7). While it is always a good idea to rinse them right before eating, if you wash fruit or veggies prior to storing them, you not only add excess moisture that can lead to decay, but you also remove the natural protective layer it has against mold and bacteria. If you feel like you must rinse your fruit or veggies before storing them, try using a vinegar solution since it can actually extend the shelf life of your produce, especially fruit. Make sure, however, that you allow it to dry properly before you store it. Vinegar is a natural antibacterial agent and thus can destroy bacteria and mold, which will help your produce stay fresh for days and possibly even weeks longer (8). Tomatoes are actually a fruit and as such, they are more delicate than some of the hardier vegetables. For starters, you should never store tomatoes in the refrigerating because it damages the membranes of the fruit, causing it to lose flavor and develop a mealy texture. Studies actually show the best way to store a tomato is at room temperature (68 degrees F) (9), which allows it to not only maintain its existing volatiles compounds that give the tomatoes texture and flavor, but to produce more of them (10). And while your grocer typically stores their tomatoes stem side down for aesthetic purposes, they are actually damaging the fruit. The “shoulders” of a tomato are the softest part, so turning them upside down almost always results in bruising. Bottom line, turn tomatoes stem side up and store them at room temperature on your kitchen counter for the best aroma and taste (11). Always keep onions in a cool, dry, and well ventilated area. Never store them in plastic bags because it prevents air circulation and traps moisture that will reduce their storage life. According to the National Onion Association, some onions, such as sweet onions, have a higher water content than storage onions, so they are already more susceptible to bruising, and typically have a shorter shelf life. To extend the shelf life of these types of onions, wrap them separately in paper towels or newspaper and put them in your refrigerator to keep them cool and dry (12). Like onions and potatoes, garlic likes to be stored at room temperature. This pungent herb also needs to have plenty of fresh air, so make sure you store it in an open container to allow good air circulation. You can hang garlic in a mesh bag or in a pair of pantyhose in a cool, dark location such as the bottom cupboard or your pantry as long as it is not too humid (13). Never remove the protective skin before you are ready to use your garlic, as this will cause it to rot faster. Brussels sprouts picked in the fall will last several weeks, possibly even into the New Year when you refrigerate them and take the sprouts off the stalk. Be sure, however, to leave all of the outer leaves intact. Store them in a bowl or open storage container. The outer leaves will shrivel and wilt, but the inner part of the sprout remains protected. Simply remove the outer leaves before cooking. Also, for that distinct strong “cabbage” flavor, store your Brussels sprouts as long as possible before cooking (14). While your instinct may be to put cucumbers in the refrigerator, according to researchers at the University of California at Davis, they actually hate the cold. In fact, anything below 50 degrees causes them to spoil faster. They do add, though, that if necessary, you can keep cucumbers in the refrigerator for 1 to 3 days if you use them as soon as you take them out (15). Like many veggies, cucumbers are susceptible to ethylene gas exposure, so keep them away from bananas, melons and tomatoes for the best shelf life. Always trim off the green tops of your carrots before storing them as the leaves pull moisture from the root and cause your carrots to go limp. Once trimmed, carrots can keep in the refrigerator for up to three months, but only if you don’t wash your carrots until you are ready to use them. If you buy carrots that are already trimmed, remove them from the plastic bag and allow them to dry sufficiently before putting them in the crisper drawer of your refrigerator. You can also line your vegetable drawer with a thick layer of paper towel to keep the carrots fresher, longer. Make sure, however, to check on the paper towel once or twice a week and change it out if it is damp. Carrots release a lot of moisture when refrigerated, so keep them dry (16). For the best flavor and freshness, always store your asparagus in a glass or wide mouthed container filled with water. Like a bouquet of your favorite flowers, store asparagus upright to prolong its shelf life up to a week or more (17). How you store avocados depends on several things: how ripe they are and whether you cut them. Typically, if you cut your avocado and it’s not ripe yet, just sprinkle the exposed flesh with lemon or lime juice to stop it from oxidizing (turning brown), then place the two halves back together and cover tightly with plastic wrap and refrigerate. Make sure to check it periodically, however, to see if it has softened, then enjoy. How fast it ripens will depend on how firm the fruit was when you cut it and the temperature it is stored at. For the most part, unripe, firm or green avocados can take four to five days to ripen at room temperature, although you should avoid putting them in direct sunlight. If you haven’t already cut them, refrigeration will slow the ripening process, so only store unripe fruit in the fridge if you have already cut it. Otherwise, store at room temperature (18). To hasten the ripening process, you can put your avocados in a paper bag (19). Most fruit and veggies spoil when they are too wet, but broccoli loves moisture. While you should always eat it as soon as possible because it doesn’t naturally keep long, you can prolong its shelf life by misting unwashed heads and wrapping them loosely in damp paper towels before refrigerating. If you use it within two to three days, it will remain fresh and crisp. 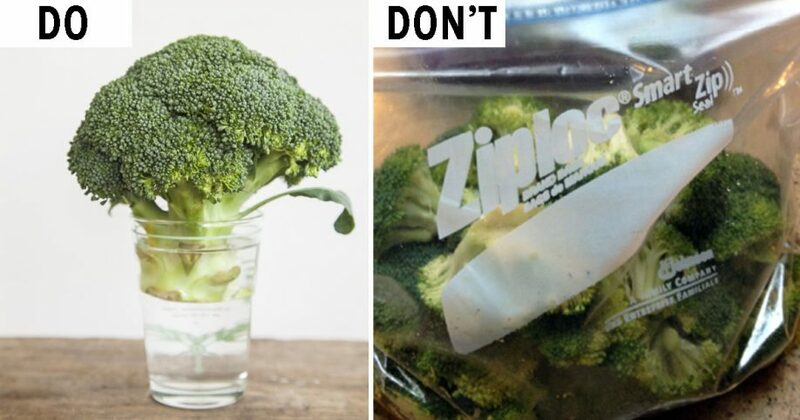 Never store broccoli in a sealed container or plastic bag, as it needs proper air circulation. Even though it likes moisture, like other veggies, you should never wash it before storing as excess moisture promotes mold (20). Your grocer typically sells cauliflower tightly wrapped in cellophane, which traps moisture and promotes rot. So, when you get it home, unwrap it and transfer to a loosely sealed plastic bag. Add a paper towel to absorb any excess moisture. When stored like this, whole cauliflower heads will last refrigerated for 4 to 7 days. Precut florets, however, should be eaten within 4 days for optimal freshness and flavor (21).